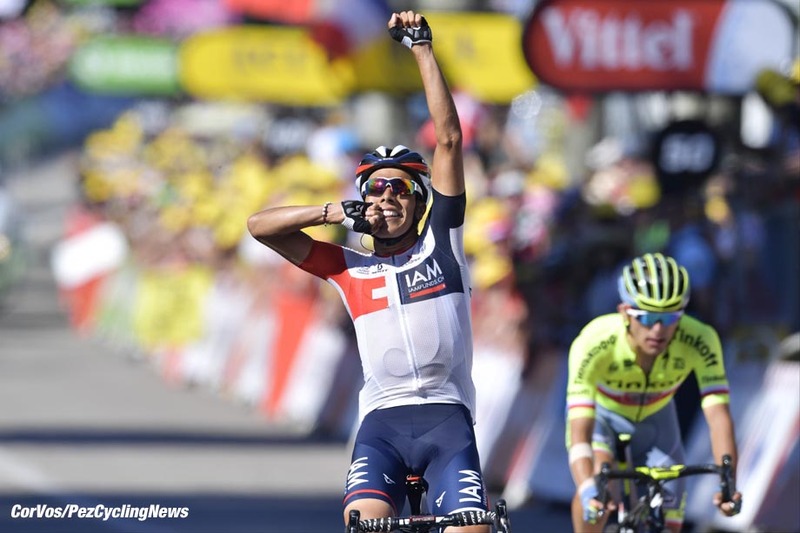 Race Report: Jarlinson Pantano was dropped multiple times on stage 15, but he fought back every time to take a wonderful stage win in Culoz. The Colombian's team, IAM Cycling, is folding at the end of the year and this should help him secure a new contract. No fireworks in the GC and Chris Froome holds onto his yellow jersey. After a fast start, a break of 28 riders formed and these would be the riders who would fight out the stage victory. The race blew up on the first category opening climb and all the sprinters were shown the backdoor, however, the pace eased and no one was willing to push on so the peloton regathered and set about chasing the break. It was all together until the foot of the Grand Colombier when Rafa Majka and Ilnur Zakarin forged clear. They were chased by Pantano and Alaphilippe and eventually there was a leading quartet as they hit the descent. Alaphilippe crashed and Zakarin was distanced on the second ascent of the Colombier. Majka looked by far the strongest and he was able to distance the Colombian on the climb. Pantano threw caution to the wind and caught the Pole on the descent before outfoxing him with a fantastic final sprint. There wasn't much to say about the GC group, Sky continued to set a hard pace on the climb and despite some half hearted attempts to break clear the biggest news was van Garderen's time loss on the second ascent of the Colombier. The fifteenth stage of the 2016 Tour de France started in Bourg-en-Bresse, famous for its Bresse chicken which can only be produced in the region. The riders started climbing almost immediately on a course that looks like the heart rate of the sprinters when they first saw it. The first classified climb came after 16.5km, the first category Col du Berthiand (6km @ 8.1%), there was more unclassified climbing before the second category Col du Sappel (8.8km @ 5.6%). The Col du Pisseloup (4.9km @ 5.8%) and Col de la Rochette (5.1km @ 5.4%) followed in quick succession before yet more unclassified nastiness deposited the riders at the foot of the main difficulty of the day, the Hors-Category Grand Colombier (12.8km @ 6.8%) and its tortuous hairpins. Once off the climb the peloton, or what's left of it, can enjoy the first flat roads of the day as they enter Culoz in what will be a dress rehearsal for finalé in 24km. Once through Culoz they looped back out again in the direction of the Grand Colombier for one final climb, Lacets du Grand Colombier (8.4km @ 7.6%) and then descend the same roads they used to get off the Grand Colombier. There is barely 8km of flat from the base of the final climb to the finish, not enough to dissuade any attackers. 184 riders set off, still a hugely inflated number for this deep into the Tour. The only two non-starters from yesterday were Matti Breschel (Cannondale-Drapac) and Jens Debusschere (Lotto Soudal), both had suffered very hard crashes in yesterday's stage and so failed to take to the start line today. After 5km of processional riding the first attack was launched by Tsgabu Grmay (Lampre-Merida), he was brought back but polka dot wearer Thomas De Gendt (Lotto Soudal) was the next to jump clear. He was brought back and it was all together with the peloton stretched out in one long line as they raced towards the first climb. As the peloton hit the first climb it was still all together, not good news for the sprinters who would've hoped for a slightly more gradual start. However, there was a lead group beginning to form. Rafa Majka (Tinkoff) and Alexis Vuillermoz (AG2R-La Mondiale) had a 100m lead with Ilnur Zakarin (Katusha) chasing hard. At the rear of the peloton it was a chance for the flat men to wave goodbye to their colleagues as they drifted off on the steep opening climb. Vuillermoz dropped back but Majka and Zakarin paired off and were forging on. Majka crossed the line first for maximum points but their advantage was hardly secured as a chase group containing Vincenzo Nibali (Astana) was barely 20 seconds back and the Sky led peloton had a deficit of less than a minute. After a very fast paced start there was a chance for everyone to take a breather. Up ahead, Majka and Zakarin had been caught by the 28 rider strong chasing group to form a lead group consisting of; Jon Izagirre and Nelson Oliveira (Movistar), Vincenzo Nibali and Tanel Kangert (Astana), Majka (Tinkoff), Domenico Pozzovivo and Alexis Vuillermoz (AG2R-La Mondiale), George Bennett (LottoNl-Jumbo), Haimar Zubeldia (Trek-Segafredo), Stef Clement, Jerome Coppel and Jarlinson Pantano (IAM Cycling), Pierre Rolland, Tom-Jelte Slagter and Dylan Van Baarle (Cannondale-Drapac), Serge Pauwels (Dimension Data), Tom Dumoulin (Giant-Alpecin), Steve Morabito and Sebastian Reichenbach (FDJ), Bartosz Huzarski (Bora-Argon 18), Alberto Losada and Zakarin (Katusha), Kristjian Durasek, Tsgabu Grmay and Jan Polanc (Lampre-Merida), Romain Sicard and Thomas Voeckler (Direct Energie), Julian Alaphilippe (Etixx - Quick-Step), Dani Navarro (Cofidis) and Ruben Plaza (Orica-BikeExchange). One name to pay attention to in the break was Reichenbach, named after the location of Sherlock Holmes' demise - spoiler alert, he sat just 11 minutes back from Froome and the yellow jersey. The race had settled down significantly but it was reignited by Thomas Voeckler as he leapt away to take maximum points on the second category, second climb of the day with Majka trailing to draw level with De Gendt in the king of the mountains race. Serge Pauwels was the first over the next climb, the Col du Pisseloup, but there was no intensity in the peloton's chase and they had let the gap grow almost to the seven minute mark. This was allowing most of the flat men, who had been dropped on the first climb, to hop back on the peloton. Pauwels' kick had drawn out Majka and the duo were now going away from the rest of the lead group as they continued their race towards the main difficulty of the day. However, they were brought back shortly after thanks to an acceleration by Voeckler. The break were continuing to gain time but it was very fractious and not working well together. Van Baarle was the next person to try his luck off the front of the group as they made their way through the feedzone and the mid point of the day. Van Baarle was soon joined, and then dropped by Dumoulin. The Dutchman was flying up the uncategorised climb but he was now being chased by Vincenzo Nibali who had also got tired of being in the lead group and set off alone. Nibali was assisted in his chase by Pantano and Pozzovivo and, although they could keep the lone Dutchman in their sights they hadn't yet been able to draw him back. With the first turns of the Grand Colombier in view he was content to sit up and form a leading quartet. They were chased hard by the FDJ led group and remained in view as they navigated their way towards the summit. Van Baarle, Polanc, Coppel and Losada were the first to lose touch with the chasing group as the gradient began to kick. Grmay was the next to go as the junction was made between the two groups. Navarro was the next rider to clip off the front as the group was now combusting as riders attacked and the climb stepped up. Surprisingly Nibali and Rolland were the next to fade as a leading group began to form. Dumoulin was also one of the riders to fall backwards from the Majka, Reichenbach, Pantano, Durasek, Pauwels, Zakarin, Hurzarski, Vuillermoz, Navarro, Alaphilippe, Oliveira, Pozzovivo and Morabito group. Zakarin was the next to try and go clear and, in a repetition of earlier in the stage, only Majka could go with him. The Eastern European duo were looking by far the strongest and they were stretching out their lead on the chasers. Behind, the Sky train was rumbling on but they continued to lose time on the lead group and they were now 8:25 back with just under 50km left to ride. Their dominance was challenged by an Astana duo of Diego Rosa and Jakob Fuglsang who's pace making kicked Warren Barguil (Giant-Alpecin) out the back door. Alaphilippe had suffered earlier on the climb but he was now going clear from the chasing group. Majka and Zakarin were the first over however and the Pole took maximum points at the summit to cement his place in the lead of the KOM competition. The French chaser hit the summit with a 29 second deficit and was soon joined by Pantano on the descent. Nibali had dropped back to the peloton and his riding was now blowing the yellow jersey group apart. 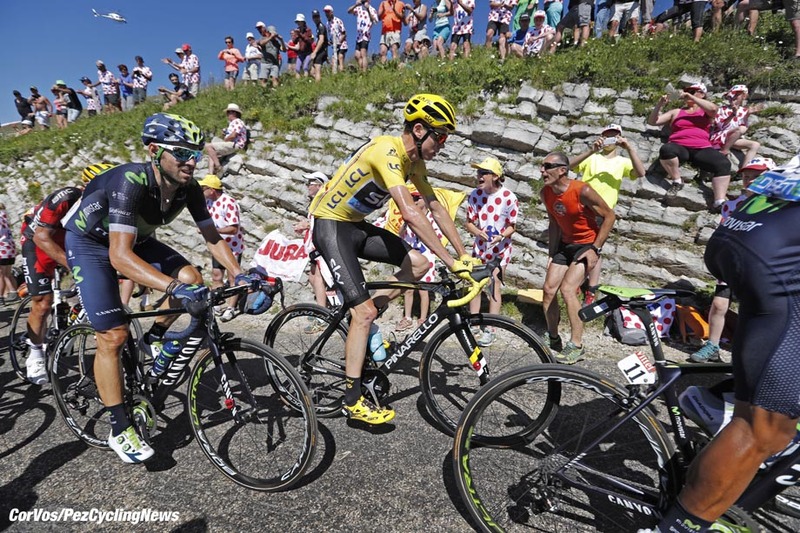 However, Froome still had three team mates left as they entered the final kilometre of the climb. Up ahead, and Alaphilippe and Pantano had linked up with Majka and Zakarin and there was now a leading quartet as they hit the base of the climb for the first flat section of the course. 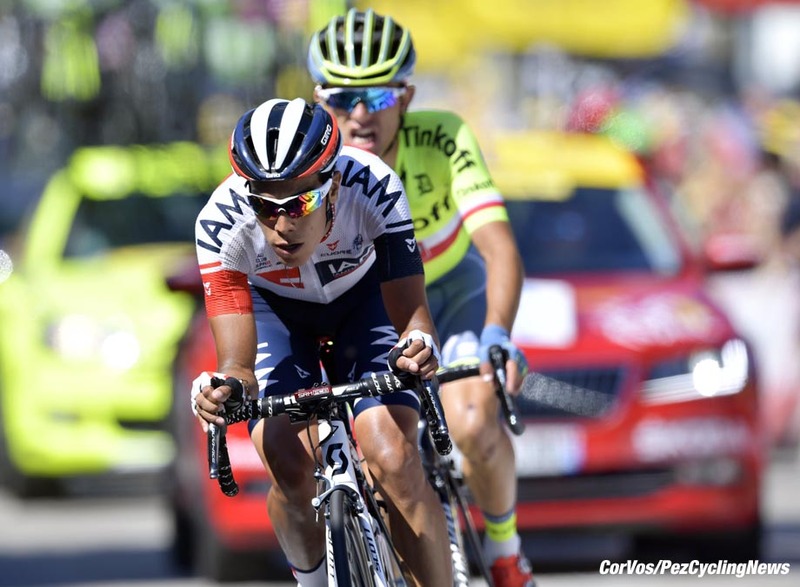 The descent had shaken up the race and now there was a leading duo of Majka and Pantano. Alaphilippe had taken a tumble on the descent and Zakarin had fallen back to the chasing group with Reichenbach, Vuillermoz and Pauwels. Pantano and Majka had flown off the climb and despite having less firepower than the chasing quartet they were beginning to pull away from them. On the final climb Pantano and Majka were beginning to lose time on the chasing quartet. Behind, the yellow jersey group were being led by Astana who were cranking up the pace on the lower slopes. Majka had attacked his Colombian break mate but Pantano had clawed his way back with 5km left to ride. After all the pace making Aru was finally sent on the attack. He immediately distanced the Froome group and was then joined by Valverde. Froome still had two team mates to use though and before we could see more attacks they had to both go pop. Majka's relentless pace had distanced Pantano once again but the IAM rider was still within touching distance. They were both still being chased hard by Reichenbach and Vuillermoz who had now linked up with Pantano. Will no one attack Froome? In the Froome group the Sky dominance was preventing any attacks but they weren't distancing anyone either. Finally, there was another attack as Romain Bardet (AG2R-La Mondiale) hit the front and was allowed to push clear. Meanwhile, Majka had crossed the summit first but the chasers were within 30 seconds as he began the descent. Neither Reichenbach or Vuillermoz looked particularly comfortable descending, in fact both looked like they'd stopped off for a couple of pints at the summit and were now making their way down. Majka was helping him though by running wide on a few turns and he was soon joined by Pantano near the bottom of the climb. Bardet was caught as they crested the summit and it was all together in the yellow jersey group. Another climb gone without Froome's dominance having been tested. With 5km left to ride the leading duo were working well together but Reichenbach and Vuillermoz were waiting to pounce if they started messing around. It was a track sprint finish, Majka had pushed the Colombian to the front and he was unwilling to give up his place in the slipstream. Majka had gone too soon though and Pantano was able to creep around him and take a brilliant win which showcased his perseverance, and his availability for next year when IAM disband. Haimar Zubeldia (Trek-Segafredo) led the main favorites home, looking to distance Tejay van Garderen (BMC) who had gone backwards on the second ascent of the Colombier. 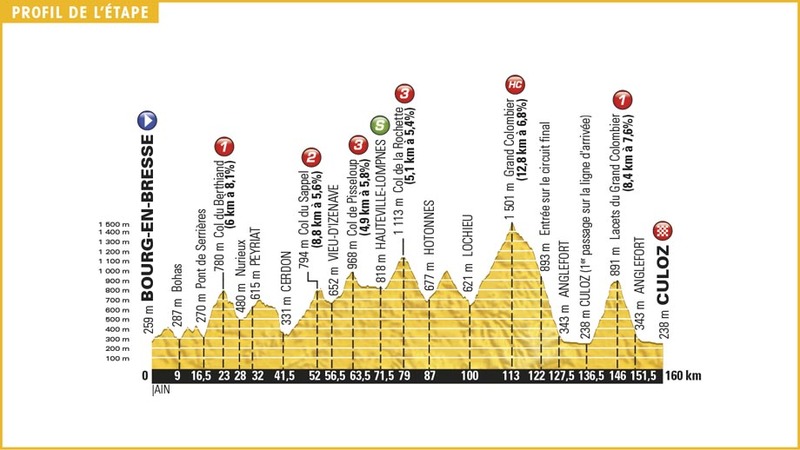 Froome will be able to cross this potentially troublesome stage off but for the rest of the favorites they will have to take a look at themselves and see whether they're happy to merely ride in Sky's wheels for the next week. Stay tuned to PEZ as Ed Hood hits French soil today to take up his RoadSide position for the final week of the Tour. Keep your eyes on Steephill.tv for live stage viewing near you. 25. Joaquim Rodriguez (Spa) Katusha. 25. Tanel Kangert (Est) Astana at 36:52.